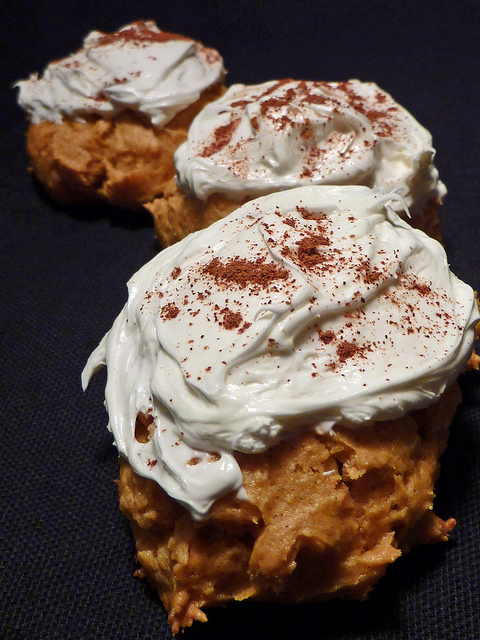 Spicy pumpkin cookies are heavy, delicious — and sure to please | write meg! Friends, family and occasional visitors of write meg! will know that I’ve become a bit of a nut about pumpkin. I can’t tell you quite when my obsession with the gourd began, but I do know that I’ve become known in some circles for my devotion to all things pertaining to that bright orange vegetable. And, you know, I have a reputation to uphold. Months after I began my search, I finally found cans of pumpkin — not pumpkin pie mix, friends, but just plain ol’ pumpkin — at my local Safeway this week. I have this booklet filled with cookie recipes and, since it’s officially fall, I knew it was time to try my hand at these little babies. For the moment, though, I just can’t shake my fascination with dessert — and my excitement at the prospect of actually being able to make something like this on my own. My latest batch of goodies come in the form of Spicy Pumpkin Cookies, a recipe I pulled from a tiny Betty Crocker booklet, “Great Cookies,” I’ve kept in my purse for weeks. Yes, I seriously walk around with cookie recipes on my person at all times . . . just in case, you know, I get the urge to bake. And I do get that urge. I do. 1. Heat oven to 375 degrees F. Lightly grease cookie sheet with shortening. In large bowl, mix cake mix and pumpkin pie spice. Stir in pumpkin and butter until well blended. Stir in raisins, if desired. 2. Drop dough by generous tablespoonfuls about 2 inches apart onto cookie sheet. 3. Bake 11 to 12 minutes or until set and light golden brown around edges. Cool 1 to 2 minutes; remove from cookie sheet to cooling rack. Cool completely, about 30 minutes. Frost with frosting. Sprinkle with nutmeg or cinnamon. Delicious! This is a heavy cookie — not light and fluffy — but I think that works well for the autumn-infused pumpkin flavor. The recipe was very simple and I left out the raisins, since no one in my house is a fan. I was a little generous with the frosting, but can anyone ever be too generous with frosting? And I think the creamy vanilla was a great complement to the cookie. Overall, very tasty — and I’d wager a crowd pleaser. Mine took longer to bake than 11-12 minutes — it was probably more like 15 — but keep an eye on them . . . the bottoms brown quickly. These look amazing! I get so excited for the Fall because of things like pumpkin cookies, apple cider..but ESPECIALLY Pumpkin Spiced lattes from Starbucks! These look delicious I love fall! And while cookies and cupcakes may not be a good dinner, they’re a delicious breakfast. Since they contain a vegetable, those cookies would make a meal – at least for me and my twisted logic! Your cookies are gorgeous! I love pumpkin stuff (except the latte!) :–) But I notice a lot of the coffee makers are also coming out with a pumpkin spice coffee for the month. The cookies look great, and today IS National Homemade Cookies Day, so it’s a perfect post! OOOo I want one with a cup of coffee. Mmmmn pumpkin anything is great for me! Thanks for sharing — looking forward to making them! And I never crave pumpkin in the summer. Oh these look fabulous! I agree, you can never have too much icing. I like the idea of icing on a cookie. I am less into baking lately as I am into making ice cream (though I’m sure that will change as it gets colder out). You have inspired me to figure out how to make pumpkin ice cream! That sounds totally delicious, Tipsy — thanks for sharing! Also, Swallow got here today! THANK YOU!! Yummy! I love love anything pumpkin spice flavored! Okay. Must.Make.These.This.Week. I love pumpkin and I love spice and I love easy and Mr. BFR loves dessert. And who doesn’t have recipes with them at all times? THe first ap I downloaded to my Blackberry was the Food Channel. don’t know that I have ever seen cookies made from a cake mix..but I have to give these a try this week. Perfect cookie for this time of year. With pumpkin in it, I might even call it semi-healthy. Thanks for sharing. I’ve never had any kind of pumpkin cookie, but those look amazing so I might have to try them! This looks delicious … and easy too. My kind of recipe. I’m adding the yellow cake mix to my shopping list and I’m ready to make them. I’m so happy it’s pumpkin season again ! These would be divine with those pumpkin spice latte’s I’m so fond of 🙂 Or maybe that would be pumpkin overkill??? No – Never! 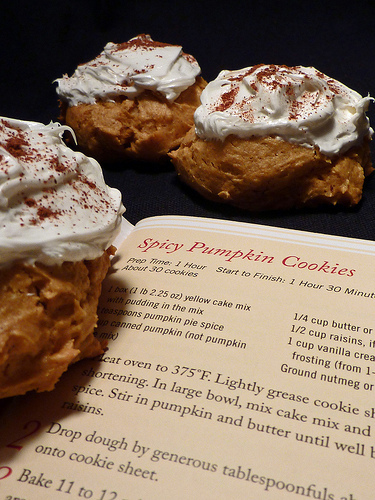 I love pumpkin… these look heavenly! Can you ever have too much frosting? Mmm … The best part of this post? I saw it right before I’m going to lunch! So I can satisfy my now growling-fiercely tummy, haha 🙂 Looks amazing, thanks for sharing! Thanks Meg – you rock! Spicy pumpkin cookies? This recipe is truly creative! The pumpkin cookies perfect for fall season and spicy flavored is very unique especially with some milk to ease the spice. Lol. The milk and spicy pumpkin cookies are the best combination for me from now on. I am normally a cupcake person, but I am definitely making these!! !